Technological advances have benefited our world in immeasurable ways, but there is an ominous flipside. Criminals are often the earliest, and most innovative, adopters of technology and modern times have lead to modern crimes. Today's criminals are stealing identities, draining online bank-accounts and wiping out computer servers. It's disturbingly easy to activate baby cam monitors to spy on families, pacemakers can be hacked to deliver a lethal jolt, and thieves are analyzing your social media in order to determine the best time for a home invasion. Meanwhile, 3D printers produce AK-47s, terrorists can download the recipe for the Ebola virus, and drug cartels are building drones. This is just the beginning of the tsunami of technological threats coming our way. In Future Crimes, Marc Goodman rips open his database of hundreds of real cases to give us front-row access to these impending perils. Reading like a sci-fi thriller, but based in startling fact, Goodman raises tough questions about the expanding role of technology in our lives. 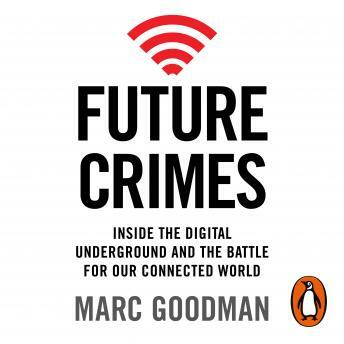 Future Crimes is a call to action for better security measures worldwide, but most importantly, will empower readers to protect themselves against these looming technological threats - before it's too late.